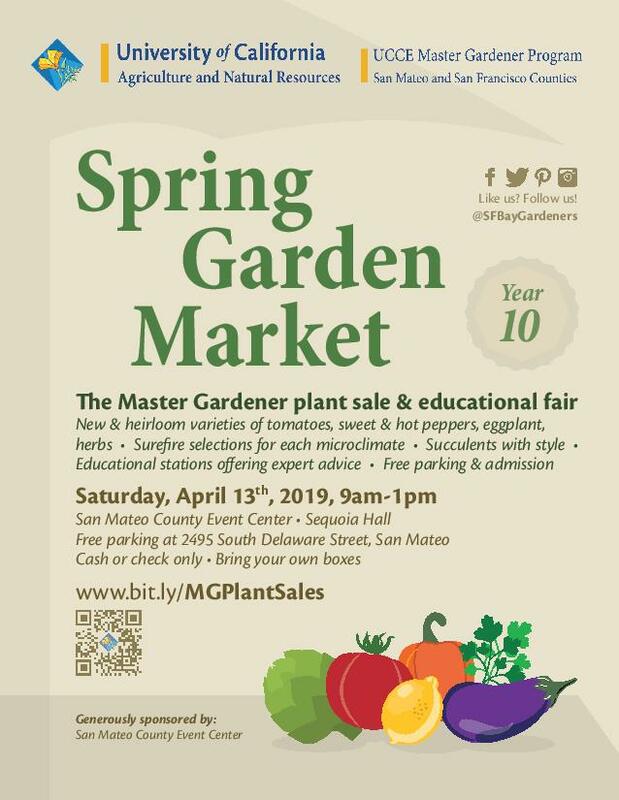 The annual Spring Garden Market is a plant sale and educational fair brought to you by the UCCE Master Gardeners of San Mateo and San Francisco Counties. We offer more than 5,000 vegetable plants, herb starts, and succulents to get your home garden started. You’ll discover a wide variety of heirloom tomatoes, sweet and hot peppers, other vegetables and herbs that have been expertly selected and lovingly grown by us for you. We’ve carefully chosen top-performing varieties for each microclimate, ensuring that you’ll have a productive and flourishing garden this year. NEW! Explore the plant varieties that we’re offering by visiting our UCCE Master Gardeners’ Plant Library. Read about each of the varieties and download plant lists to bring with you to the sale! There will be educational tables to help you select the best plants for your garden, and we’ll provide tips on how best to plant, grow and care for your new seedlings. Don’t miss our other activities and features too, including our exhibit and sale of beautiful succulent arrangements.